ON numerous occasions over the years I Spy has come across truckies who look like or reckon they are clones of famous people. Some even have the nicknames of those who they are mistaken for. Often it is a difference of opinion whether they do in fact resemble the well knowns. I have seen truckies who say they are genuine lookalikes of Shrek, Lurch, Mork of Mork and Mindy, Chopper Reed, Russell Crowe, Bill Clinton, Dean Martin, Tom Cruise, Ricky Ponting, Brendan Fevola, Michael Clark, Lindsay Fox and a swag of others. 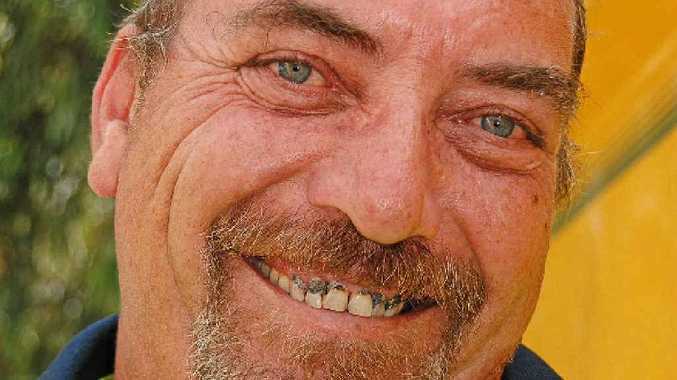 Down in southern Tasmania, well known truckie Greg Cunliffe is affectionately known as Lurch, which he will tell you is because some feel he resembles the character of the name in the old television series The Addams Family. "I don't even answer to Greg as I don't hear it enough as everybody calls me Lurch and it has stuck like glue," he said. 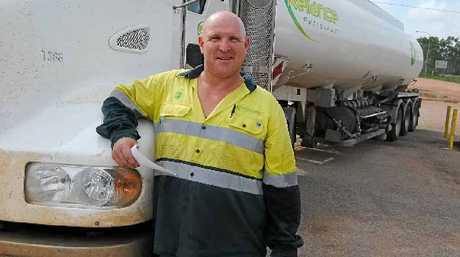 Up in North Queensland friendly driver Steve Symonds is affectionately called Shrek by mates. I Spy saw the 41-year-old Steve as he was preparing to deliver fuel to a Woodstock roadhouse. FAMOUS? Can you see any resemblance to Shrek in this photo of Steve Symonds? "I have been doing the job for the past five years and love it. Everybody calls me Shrek because they reckon I look like him," he said. One of the best cases I have seen was when three truckies were enjoying breakfast at a café popular with road transport workers when a gentleman and his wife came in and sat at the table beside them. One of the truckies whispered to his mates that he thought trucking magnate and legendary businessman Lindsay Fox was the man in question. Without wanting it to be too obvious the others tried to get a better look at him and they agreed it may well be Mr Fox. They even checked out what he was reading in the local paper and he appeared to be browsing through the sports pages. Before he left one of the truckies even asked the man if he was indeed Mr Fox. The super friendly gent answered in the negative but did say he was often mistaken for the famous man. Even with that information one of the truckies Googled Lindsay Fox when he next had access to a computer and finally reasoned it wasn't him. But it was one genuine Lindsay Fox clone. If any truckies reckon they are a lookalike of a famous, or maybe not so famous person, they can email a pic to editor@bigrigs.com.au. ON the subject of nicknames, I Spy saw two interstate truckies at a Queensland roadhouse parking area early in the New Year who were being fairly negative about aspects of the road transport industry. They freely admitted to having a nickname given to them by colleagues. "We are known as Doom and Gloom," one said which was accompanied by a laugh from both. "And we are quite proud of it," the other quipped. TWO truckies stopped off at the public toilets situated in the beautiful park at historical Campbell Town Tasmania in early January, and much to their chagrin it was full. Nearby they saw scores of young ladies sitting around and wondered what was going on at the normally quiet toilets. Two polite ladies stood outside to inform the drivers that the youngsters were part of a Girl Guide Jamboree being held in Tassie with participants from around the country. "There are too many girls here and the ladies toilets are not big enough so they are using the men's for a short time," one said. Being understanding truckies they agreed to wait. But as the minutes ticked by one of the drivers was feeling the need for an urgent call of nature. Problem was quickly solved when one of the Guide supervisors directed him to the disabled toilet which was not in use. Also at the Campbell Town Park is a massive log which is under an open sided shed. WORD PLAY: What’s prohibited? The log or the dog? This was donated by the O'Brien family in recognition of the timber industry in the nearby forest area and is much photographed by tourists. Near the log is a sign which advises that dogs are prohibited. 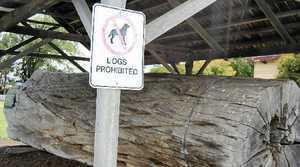 Some wag has got to work and changed the D in dog to an L which made it read Logs Prohibited. The graffiti artist has ensured many pics are taken of the sign. DEATH is not a subject that most of us discuss and that would be the case with the majority of truckies. 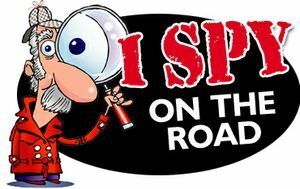 But in the past six months during frequent visits to roadhouse parking spots or rest areas, I Spy has noticed some drivers have. Many have said they have taken out funeral insurance plans. Many are older truckies in the plus 50 age bracket however some are aged 30 to 40. They don't want to leave their loved ones with a big funeral bill if the time comes early. Most reckon truckies have a big risk of death due to sickness or an accident. A STRESSED out Victorian truckie was feeling down, which he told another driver when they were parked beside each other at a roadhouse. The other truckie was from NSW and offered him use of a back scratcher with a genuine difference. "It was made from a kangaroo paw and had a long handle and I was able to scratch my back with it and it really made me feel good," he said. That wasn't the end of the story either. The gent pulled out a bottle opener attached to two rather large roo testicles. He had purchased the roo scratcher and bottle opener from a shop in Queensland. Some strange things do happen whilst on the road.